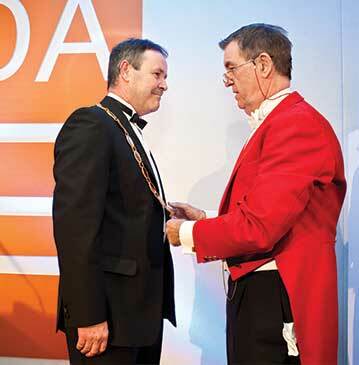 At the EDA’s Annual Awards Dinner on 12 March 2015, the outgoing President of the Association, Simon Barkes (pictured on the right above), handed over the Chain of Office to Tom Jones to mark the start of his two-year term. Since joining the Board of the EDA in 2011 Tom has worked tirelessly on behalf of the Association, in particular on all matters to do with education and training. 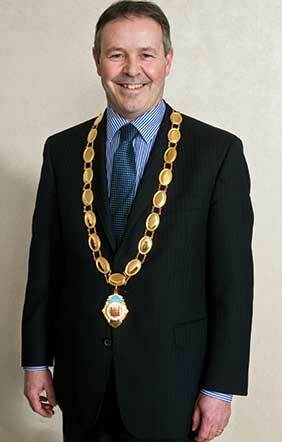 He brings a wealth of knowledge and experience coupled with drive and determination to the role. Tom joined the electrical wholesale industry over 30 years ago. Most of his career has been with Lockwells, which he joined in 1985. Having successfully managed on-going business, start-ups and turnarounds for the company for 10 years, he was invited to join the board in 1995, becoming Managing Director in 2006 and running the 21 branches spread throughout England and Wales. When the company was acquired by Edmundson Electrical in November 2014, Tom became Divisional Director for Lockwell on behalf of Edmundson Electrical Ltd.
“One of the major themes of my two-year presidency will be growing the essential partnership between the wholesaler and manufacturer. I believe that the essential relationship that enables the wholesaler to deliver good quality products, service and support to our contractor customer, is the one we have with our manufacturers. I will be encouraging wholesalers to recognise the importance of this relationship by working more closely with their suppliers. “Some examples of how they can do this is carrying out more joint customer visits, providing end-to-end solutions for contractors, surveys and quotations, technical support and improved trade counter displays to better show our contractors the breadth of product range available and highlight new innovations. “I will be asking wholesale members to ‘up-sell’ ‘not down-sell’ products and to choose higher quality products and not be tempted to go for the cheaper, inferior quality option. This will improve the offering for our customers and enhance our relationship with our suppliers. I believe it is important to make sure that the EDA’s affiliates members continue to feel valued in this essential partnership with the Association and its members, so during 2015 we will be arranging meetings, with the purpose of listening and understanding how we can better add value and benefit to everyone in our organisation. The second theme that is very close to my heart is education and training. During my time on the EDA Board I took responsibility for that activity. I understand the product portfolio well and have worked closely with our training providers. In the short term we will continue to improve the quality of our MOL Product Knowledge module offering for wholesale staff, with the ambition of adding new modules to the programme and also offering these online, as they currently are delivered only in hard copy booklet format. We are constantly looking for ways to encourage new talent into the industry and I believe that career-enhancing training is a good way to do this. So I am pleased to announce that we will be delivering next year, for the first time, a bespoke, NVQ, Electrical Wholesale Apprenticeship, which will encompass many of the day to day aspects of electrical wholesaling: Warehousing & Stores, Deliveries, Goods In and Goods Out, Procurement, Telesales and Customer service. The qualification will also encompass Product Knowledge training as a part of its programme. “One of our immediate challenges is to raise greater awareness among our membership about the EDA Education and Training Portfolio as it stands today. Companies that have been involved in training their staff in the past come back time and time again to enrol in our programmes. However, there are many members who have yet to engage and we are working hard to spread the word throughout our membership. Our recently appointed EDA Ambassadors have had a huge impact in getting the word out to their members. Another way to spread the word is through our Regional Business Forums and we are very excited to be holding our first Scottish Regional Business Forum in Paisley on 21st May.